H. Rick Bamman - hbamman@shawmedia.com Jacobs Joe Gonzalez returns a kick up field. 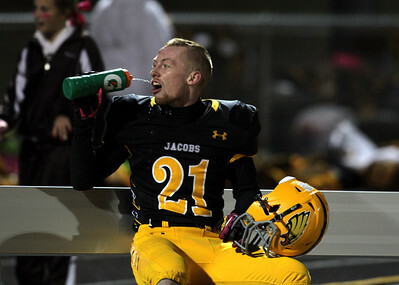 H. Rick Bamman - hbamman@shawmedia.com Jacobs's Jake Gierlak hydrates on the bench. H. Rick Bamman - hbamman@shawmedia.com Jacobs' Hunter Williams hangs on to a Brett Mooney pass late in the fourth quarter. H. Rick Bamman - hbamman@shawmedia.com Crystal Lake South's Corbin Pennino (22) intercepts a Bret Mooney pass intended for Jacob's Jake Gierlak in the second quarter. H. Rick Bamman - hbamman@shawmedia.com Jacobs Hunter Williams holds on to a Bret Mooney pass for a gain of 15 yards for a first down in the first quarter as Crystal Lake South's Corbin Pennino maks the stop. South won 32-29. 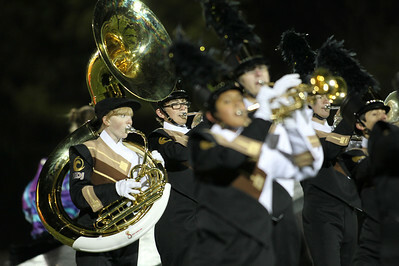 H. Rick Bamman - hbamman@shawmedia.com The Jacobs marching band performs at halftime. 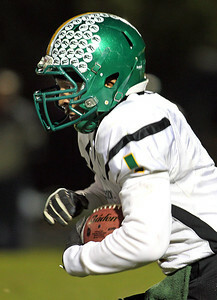 H. Rick Bamman - hbamman@shawmedia.com Crystal Lake South's Zevin Clark runs for a first down against Jacobs. Crystal Lake South won 32-29. H. Rick Bamman - hbamman@shawmedia.com Crystal Lake South's Chris Ivers runs for a first down in the closing minutes of the fouth quarter while persued by Jacobs' Adam Kulon. South beat Jacobs 32-29 Friday, October 12, 2012. H. Rick Bamman - hbamman@shawmedia.com Crystal Lake South's Casey Oliver watches his field goal attempt sail through the uprights in the last second of the game against Jacobs. Oliver's try was good and South beat Jacobs 32-29. 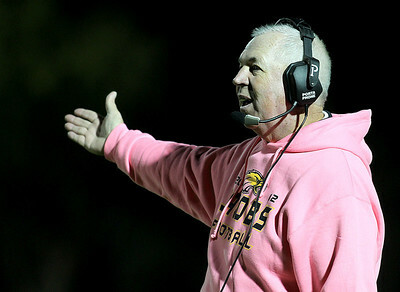 H. Rick Bamman - hbamman@shawmedia.com Jacobs's head coach Bill Mitz asks the officials why they did not allow him to call a time out prior to Crystal Lake South's field goal attempt in the last second of the fourth quarter. 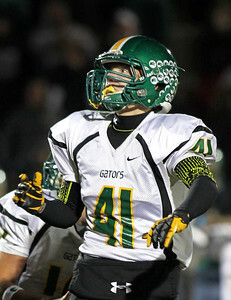 Crystal Lake South won 32-29. H. Rick Bamman - hbamman@shawmedia.com After slipping and falling to the turf on the ast play of the game Jacobs' Josh Walker (85) is consoled by teammate Greg McLeod. Crystal Lake South's Corbin Pennino (22) intercepts a Bret Mooney pass intended for Jacob's Jake Gierlak in the second quarter.